Brands on Facebook have new types of interactions to measure, as the social network has finally rolled out its anticipated “Reactions” feature. 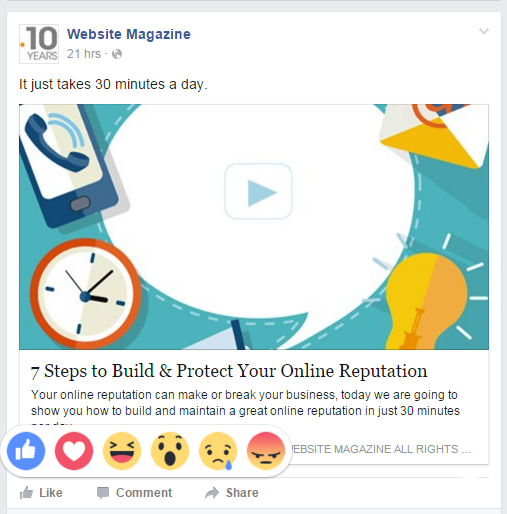 Reactions essentially provide Facebook users with a new way to “like” a post. For example, instead of hitting the like button, users can choose one of five different reactions, including “love,” “haha,” “wow,” “sad,” or “angry.” To add a reaction, users must simply hold down the like button on mobile or hover over it on desktop to see the reaction options. Reactions are currently being rolled out to everyone on Facebook around the world, and the social network notes that it will continue listening to feedback for the new feature. It will also be interesting to see how reactions impact brands, as audiences may be more likely to engage with posts if they can express the way it makes them feel with just a click (and with more than the traditional “like”).